You always brush twice a day, avoid sugary snacks between meals, and go to the dentist regularly. Do you still have to floss your teeth? The short answer: Yes, at least once a day. Flossing is probably your single most important weapon against plaque, the clingy bacterial biofilm that sticks to the surfaces of your teeth. Plaque is the principal cause of tooth decay; but it is also the cause of periodontitis (gum disease), bad breath, and other maladies. Brushing is a good start — but flossing removes plaque in places a brush can't reach, like the small gaps between teeth and under the gums. It also polishes tooth surfaces and decreases the risk of gum disease. 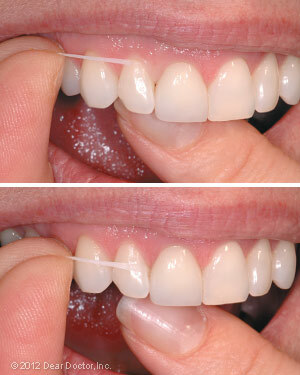 Some people may think they don't have time to floss, but once you get the hang of it, flossing only takes few minutes. If you are going to floss only once a day, it's best to do it at night just before going to sleep. That's because there is less saliva present in your mouth when you are sleeping, so plaque is more concentrated and potentially more harmful. Just in case you never really learned proper flossing techniques, here's a step by step approach including some easy tips for doing a great job. Cut off a piece of floss about 18 inches long. Wind it around the middle finger of both hands leaving a gap of around three or four inches. You will now be able to use different combinations of your thumbs and index fingers to correctly position the floss between your teeth for all areas of your mouth. TIP: The most common mistake people make while flossing is that they tighten their lips and cheeks making it impossible to get their fingers into the mouth. Relax your lips and cheeks. Now, guide the floss gently into the space between your teeth. TIP: Even if the gap is tight, try not to snap the floss into your gums as you're inserting it. A side-to-side sawing motion is good to use here, but only when slipping the floss gently between the teeth. There are two sides to each space between your teeth and you must floss each side separately so as not to injure the triangle of gum tissue between your teeth. Run the floss up and down the surface of the tooth, making sure you are going down to the gum line and then up to the highest contact point between the teeth. Apply pressure with your fingers away from the gum triangle, letting it curve around the side of the tooth forming the letter “C” with the floss. TIP: You want your fingers as close to the front and back of the tooth as possible so both fingers move in harmony up and down until you hear a squeaky clean sound. This is easier with unwaxed floss. The smaller the amount of floss between your fingers, the more control you have flossing. Next, move your fingers to the top contact area between the teeth and slide across to the other side of the space. Apply pressure with your fingers in the opposite direction and repeat. Slide the floss out from between the teeth. If it's frayed or brownish, that's good: you're removing plaque! Unwind a little new floss from the “dispenser” finger, and take up the used floss on the other finger. Repeat the process on the next space between teeth. Work all around the mouth — and don't forget back sides of the last molars.